Now as a mom of two of my own, I get it. Last night we spent the evening with one of his siblings and her family. She is also a mother to two children. Approximately the same age as my guys, “the cousins” as we call them, are like the sister (our boys don’t have) and as much another brother to both. The families are close and the foursome are quite the posse. Indeed, the adults in the family are all fiercely protective of each other’s kids, and consider them each as our “own” as well. You mess with our niece or nephew, you mess with us all, which in an Italian family, is not something to trifle with. It goes both ways. Our motto? Famiglia viena prima… Family comes first. Which leads me to God. His provision. His plans. My husband grew up without a brother, and always wanted one. 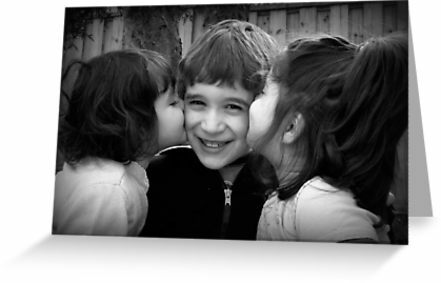 That is not to say he doesn’t love his sisters…it’s just a boy among a houseful of girls….well, he needed a brother. When our son was born, (or shall I say SUN) he continued the first-born-son tradition (5 generations in fact), which also underscored that “brother need” again. Within the year God blessed us with another pregnancy…. I will never forget the day I found out that I was going to have another boy….I called my husband and told him that his son would have the brother he always had wanted. He broke down and sobbed. It was God’s plan. God’s provision. Indeed, though my husband didn’t have a brother, he did have 3 male cousins to whom he was close. We will call them the Franks. One of them in particular is counted among his best friends. He was in our wedding. They do business together. They are growing old together. That cousin now has two sons of his own… As time goes on, my husband and his cousin(s) realize how special their bond is. The Frank’s are the “brothers” he doesn’t have….and here once again is another example of God’s plan…and proof of God’s funny sense of humour….those Frank boys? Well guess who grew up with them? Me! I never knew my hubby or his immediate family back in the growing up years, but God knew all about it…and had His plan and His provision. I met my hubby in my mid 20’s. The cousin thing was part of that connection….We married, started our own family and looking back we can now see ALL if it, was part of God’s plan. His provision. It is amazing how hindsight is truly “20-20” as they say. In the midst of things, the young lonely kid without a brother could have never seen the tapestry that God was weaving in his life. But now years down the road, it is clear to see the full circle. We have such an amazing and faithful God. He knows our hearts better than we ever could and He sees the whole “parade” of our lives; we only get to see the turn at the corner. It gives me a sense of peace and quiet sanctuary to know in the midst of good times and bad, I can review the unexpected plans of God and find comfort in knowing…He has good plans. He is our provision…He has got it covered, even when we don’t see it. …and for the brother my husband never had? Well, thank God for unanswered prayers, because God’s plan, God’s provision is richer than any of us could have ever imagined. Made me laugh and that’s a good thing. Love your family! Thanks for sharing them and your story.